Reserve 20 small pieces of watermelon for garnish. Working in batches, place the remaining watermelon, the cucumbers, red bell peppers, onion, jalapeno pepper, lemon juice, olive oil, 3 tablespoons of fresh mint, the ginger, honey, and pineapple juice into a blender, and blend for about 30 seconds per batch. The mixture should be well blended but retain some texture. Pour into a large pitcher or bowl, and refrigerate 1 hour. Serve in bowls, and garnish each bowl with a couple of chunks of the retained watermelon and 2 small mint leaves. Learn how to make this refreshing, cold-tomato soup from Andalusia, Spain. 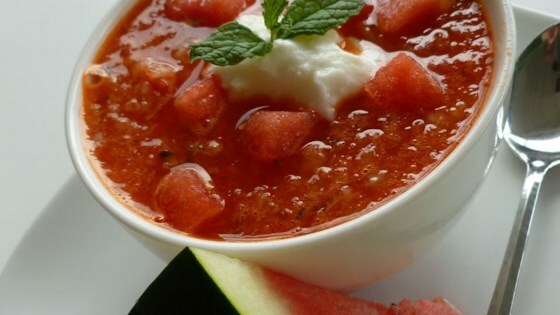 This has a good flavor and is a great alternative to the traditional gazpacho. Blending for 30 seconds was too much in my blender so I reduced the time. Everyone loved this. Leftovers were still really good a few days later.